J. Atkyn, James J. Strang, 1856, by one of the co-conspirators in his imminent assassination. 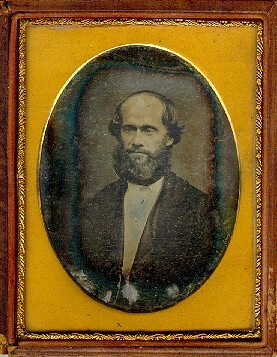 Quarter-plate daguerreotype of Strang. Tarnished at perimeter. In oval brass cut-out mat and gilded-brass preserver frame. In original velvet-lined leather (pressed paper) floral case, mended separation at hinge, lacking one clasp. In a new half-leather and hand-marbled clamshell box. Michigan's most infamous personality has been rediscovered in one of the earliest extant photographs taken in the state. The photograph was not taken by just anyone, but by a man who later plotted his certain assassination; and it was not taken just anywhere, but on a tumultuous island in the center of Lake Michigan. James J. Strang (1813-1856) is loved by many as Michigan's greatest prophet, and hated by more as Michigan's most dangerous piratebut recognized by everyone as America's only monarch. He was a debater, lawyer, abolitionist, land developer (Wisconsin and Michigan), Mormon leader, newspaper editor (New York, Wisconsin, and Michigan), temple designer, violinist, historian (Michilimackinac), news correspondent (New York Tribune), political lobbyist (Washington), and scientist (Smithsonian). He was crowned king (1850), successfully defended himself against charges of treason (1851), and was twice elected to the Michigan legislature (1853 and 1855). He was assassinated on Big Beaver Island, Lake Michigan in 1856. Strang entered the Mormon scene swiftly when in 1844 he claimed that the Mormon founders Joseph and Hyrum Smith had appointed him to succeed them just before their mob deaths. In barely a year, he had already duplicated Joseph Smith's style when he announced that he discovered an ancient American record inscribed on brass tablets in a Wisconsin hillside. Before long, he was issuing thousands of tracts and newspapers from his press in Wisconsin, and had gathered together several thousand members to his church. Brigham Young ignored Strang's affirmations, and took a separate group to near Council Bluffs, Iowa, and eventually to Utah in 1847. In the same year, Strang claimed to have a vision that the gathering place of God's faithful was instead to be in Michigan, on the Beaver Island archipelago. Land ownership disputes broke out with non-Mormons in the area, as well as jealousies over economic prosperity with neighboring Mackinac. Strang developed the city of Saint James, the best sheltered harbor on Lake Michigan, and established a steamboat wood trade and salted fish export industry. When his followers handed him a tin crown and wooden scepter in 1850, other area residents accused him of treason and robbing the U.S. mail sled. President Millard Fillmore stepped in by ordering the U.S. steamer Michigan to Saint James to take Strang to a federal trial in Detroit. Strang gained national fame and statewide favoritism from the press during the trial in which he and other Mormon leaders were acquitted. Strang had a political battle in Lansing that required an equally vigorous defense, as other politicians tried to unseat him from a late election victory in the legislative race of 1853over a quarter of Michigan's geography in the sparsely-populated north. By 1856 his movement was growing so rapidly that a daily paper was implemented, his tabernacle neared completion, his capstone Book of the Law of the Lord lay in the bindery, and he was planning a run for congress. Former Mormons conspired in his murder with the captain of the U.S. steamer Michigan, and after a few pistol shots from behind a dockside woodpile, Strang lay dying in his wounds with the assassins claiming U.S. protection aboard the boat. 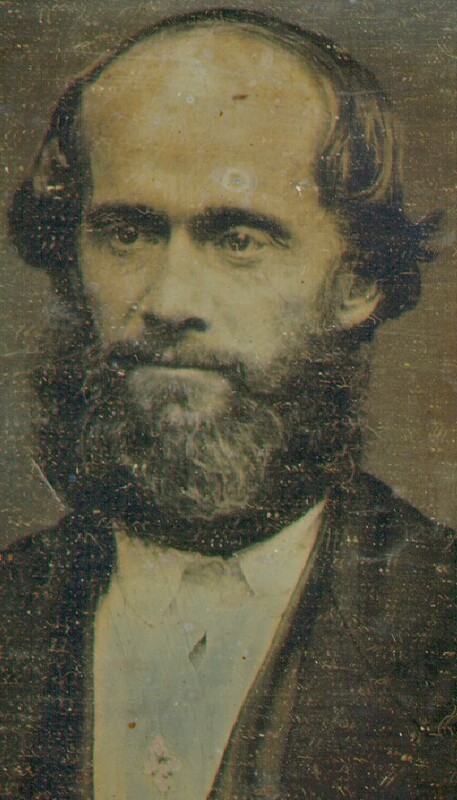 In the 1840s, Strang's physical description was remarked on by newspaper articles about him from Wisconsin to New York, with reporters observing his keen gaze, high forehead, and red beard. The Strang daguerreotype is the only original portrait of him now located, and all other images known are copies. However, there are probably other photographs in existence that may resurface in institutions or in the familyStrang had to please five polygamous wives with his memory. This one is the same daguerreotype pictured as the frontispiece in Milo Quaife's Kingdom of St. James (Yale University) and also used on early postcards published on Beaver Island. The portrait most recently appeared on the wrapper cover for this year's John Whitmer Historical Association Journal (associated with the Mormon History Association). Correct and Life-like Daguerreotypes. J. Atkyn. Daguerrean Artist. St. James Hall, Beaver Island, Mich. Having fitted and furnished his Daguerrean Room in a style for comfort and convenience, not surpassed by any in Manitue and adjacent counties, will be happy to receive visitors. His mode of taking pictures completely obviates the necessity of sitting from one to three minutes. It can be done as well in from ten to thirty seconds, and in all cases less than one minute. N. B. Instructions in the art, with all the late improvements, given. Ladies and gentlemen would do well to give him a call. His pictures are taken on silver plate, over which is a coating of gold. They will not corrode at sea, or change in any climate; are beautiful in tenor, bold and clear in effect. Call and examine specimens, at St. James Hall. Gallery open from 9 A.M., to 4 P.M.
Likenesses taken in clear or cloudy weather. Beaver Island, April 28, 1856. Dr. J. Atkyn first appeared in Saint James, Beaver Island, Michigan in 1850, after he was dropped from a steamboat for refusing to pay passage money. He went back and forth between Mormons and non-Mormons, offering services to each as a spy upon the other. He soon disappeared, but returned again to Saint James in 1852 in the same manner, in low health. He claimed the charity of James J. Strang as a brother master-Mason in distress. Strang took care of him for three weeks, until his health recovered, then furnished him with money to leave. Atkyn must have spent the intermittent time in other Great Lakes ports and in the transient town of Council Bluffs, Iowa. He is the probable author of a distasteful broadside published at Council Bluffs on 1 June 1854, aimed at Mormon leaders there. The Northern Islander later said that he "exhibited a specimen of lampooning handbills which he had got out against several respectable citizens of Council Bluffs, and given a wide circulation through the mails." Atkyn returned to Saint James as a daguerrean artist during the summer of 1855. He stopped at Saint James well dressed, and professing to be a Mormon stocked with money. He proposed to come with a daguerreotyping apparatus, and spend the winter with a good marketing opportunity at every "influx of strangers." But after a final trip east on the Great Lakes he was destitute of even one dime. He claimed that his pocket was picked under operation of chloroform in the cars near the Niagara suspension bridge, which he bolstered by a newspaper article in which the victim was not named. The capital for Atykn's apparatus and stock purchase had to come instead from Beaver Island merchant James M. Wait, who acquired it from Buffalo with regular goods imported to the island. Atkyn promised to apply his revenue to the purchase until he paid Wait in full, and he allowed Wait to own the apparatus until then. Wait also fed Atkyn and furnished his gallery room. Atkyn set up his shop in, "Saint James Hall," on Water Street, one door south of the Northern Islander office that still stands as the Beaver Island Historical Society in St. James. On 6 December the Northern Islander said "We have examined specimens of Daguerreotypes taken by Bro. A. at the Saint James Daguerrean Gallery. We feel fully justified in stating that they are equal to any in the western states, and inferior to none. Whether the artist is more skillful, his chemicals more scientifically compounded, his apparatus superior, or his sitters better looking, we know not." Strang was doubtlessly a recent subject. He was later to recant that Atkyn "rarely made a good picture, commonly an indifferent, and frequently a very bad one, and charge[d] double prices." By early winter, trouble was already sparked between Atkyn and Strang. Atkyn was reported to be boasting how strong a Mormon he was, and how much friend of "the Prophet." Strang rebuked him as pretender to a position to which he had no claim, and criticized his intemperance. Faithful Mormons observed that Atykn was "generally more or less intoxicated, and his habits were offensive and disgusting. He soon drank up his stock of alcohol, laid in for the work, and spent the balance of the season in lounging about telling tales, and nuisance." Atkyn claimed his business was ruined by slander; as restitution, he asked a dispensation to work on the Sabbath, arguing that only by that means could he pay for his stock and apparatus. By late winter, Strang said that without liquors, Atkyn was "a daily nuisance, a pitiable object finding no society," and Atkyn was complaining daily of "misery without politeness or brandy." On the reopening of navigation in the spring, Atkyn obtained a supply of liquor, and began sending bills reportedly five to six times as high as "customary for good work in best galleries." Strang politely passed off Atkyn's prior slump as attributable to climate, noting that in the coldest parts of the world daguerreotypes had never been successful: "During the extreme cold part of the winter our neighbour has sometimes failed of a satisfactory picture, but the warm weather has returned, and he can show some as perfect pictures as you will see at any city in the State of Michigan." By late spring, however, Wait had brought a suit to recover his investment in Atkyn's apparatus and stock. Like every disaffected Mormon, Atkyn attributed his losses to Strang, and accused Wait and a constable of being Strang's tools. Even so, Strang played a gentleman in his editorial: "We regret to see that recently two or three suits at law have occurred. We believe all parties would be better satisfied with a quieter disposition of their disagreements." On 6 May 1856, Dr. Hezekiah D. McCulloch and Atkyn departed on a boat for Chicago, according to port passenger lists in the Northern Islander. According to an editorial in the paper, however, the departure was more subtleAtkyn went on to a boat to order a small quantity of chemicals, and loitered on the boat until it left, taking him with it. McCulloch, of course, is known as a co-conspirator in Strang's assassination the following month. As soon as Atkyn left the island, Franklin Johnson carried off the apparatus and stock furnished by Wait, claiming it on a bill of sale from Atkyn to Johnson & McCulloch, merchant partners. Johnson is another known co-conspirator in Strang's assassination. The property, valued at two hundred dollars, had been paid by Wait to the Prindle Brothers for rent. Meanwhile, leaving Chicago, Atkyn showed up in Detroit telling merchants from whom Wait was making his purchases that Wait was unworthy of credit, and that he was engaged in horse stealing and other thefts. Atkyn next appeared in Lansing, lobbying to have county school funds withheld from Beaver Island, and reportedly "slipping away without paying his tavern bill, creating a row among his new friends." After disappearing mysteriously from Lansing House, he turned up at Jackson in another commotion. Strang said that he "assumed a new name once in a few days, ever on the move," but always a doctor. From Detroit, McCulloch wrote to Atkyn at Lansing, sending him to Mackinac to preach an invasion against the Mormons to follow Strang's death. When Atkyn and McCulloch had earlier left the island on 6 May, the next day's Northern Islander reported, "two doctors left here yesterday, and today two or three ignorant persons say they are on an errand of mischief." The Northern Islander afterwards said that Atkyn drank all the alcohol on the boat to Chicago, so the boat lamps had nothing to burn for light. Strang said, "After taking a drink, they may be such fools, but they are likely to do more mischief to themselves than anybody else. Getting up a new persecution would be an uphill business at this time." This time Strang was inevitably wrong. On 15 June the Northern Islander got what appeared to be the last word, calling Atkyn a "universal dead-head and common sponge" and nicknamed him "Dr. Akenside" (or ache-in-side). The following day, 16 June 1856, Strang was shot on the Beaver Island wharf by Thomas Bedford and Alexander Wentworth, two other accomplices of Johnson, McCulloch, and Atkyn. A turn of fate it is that Strang is saved in this "life-like daguerreotype" by the man who brought on his death. As quick as Strang was shot by Atkyn's camera, he was shot by revolvers, and in those moments Michigan's wild frontier days disappeared forever.